What does an hourglass, compass, pair of glasses or soap bubbles tell us about? 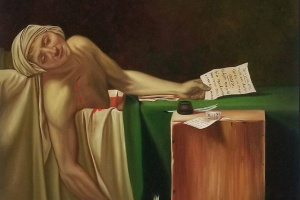 Symbolic images of human age, young and old, as well as beauty and withering of the human body was the favorite theme of artists in different times. It is worth of paying our special attention to this eternal topic in art, scrutinizing accompanying symbols. As time flows, there is an obvious transfiguration and transformation of the human body takes place. The transient nature of life obviously proves the frailty of any earthly things. A deep philosophy, reflected externally — that’s what mostly attracted artists addressing this topic at all times. And there is no philosophy without symbols and allegories. The main periods of human life are consistently associated with four seasons. In accordance with the Renaissance principles, they were often supplemented by appropriate companions or attributes. For example, childhood was certainly accompanied by a child or by frolicking children resembling putti. 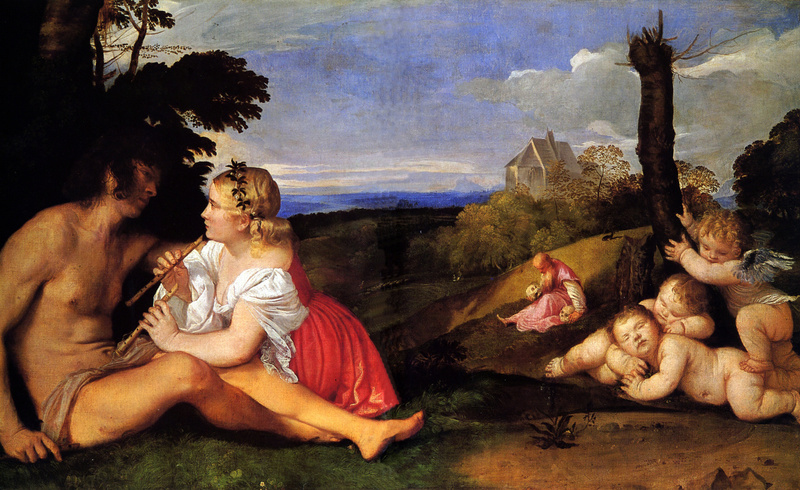 The youth was often accompanied by musical instruments, which in Renaissance painting were associated with love pleasures. When ideals of Enlightenment affirmed, hopes were pinned on young people. 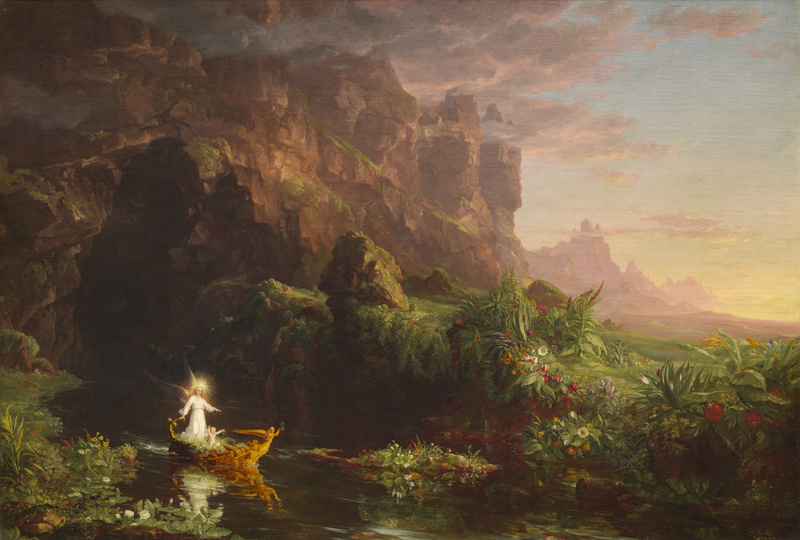 Floating ships, small boats as well as romantic sailboats, symbolized images of their successful prospects. A ship is a metaphor for life: a human being rushes along the waves of everyday life. 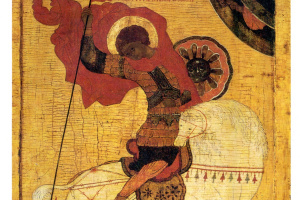 The maturity is depicted as a warrior in armor; or artists supply a hero with a compass. 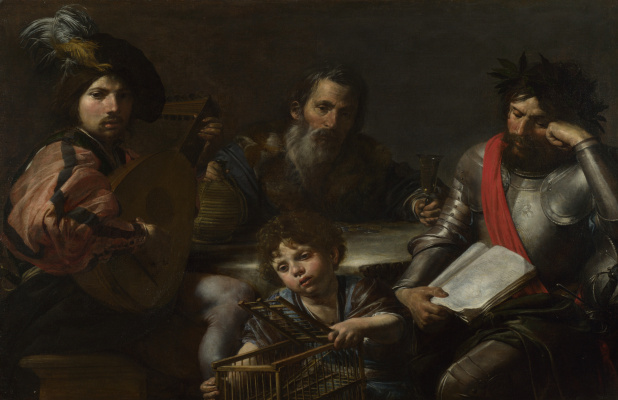 Left: Valentin de Boulogne, The Four Ages of Man, c.1629. The National Gallery, London. A compass symbolized reasonableness, because its arrow always points strictly to the north, and neither the weather nor any other extraneous processes affect its being straight and clear, as it should be in prudence. In the 15th century, time measuring instruments became popular-a sundial with a corrective compass. You can often see such outlandish instruments on canvases of the Old Masters. An unclear elongated spot in the lower part of the picture is a human skull distorted in perspective. To see its clear image, you need to move to the right. 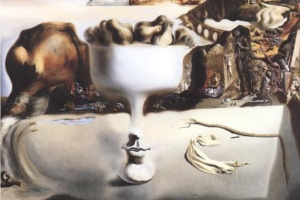 Technique, intentionally distorting the form, was called "anamorphosis". 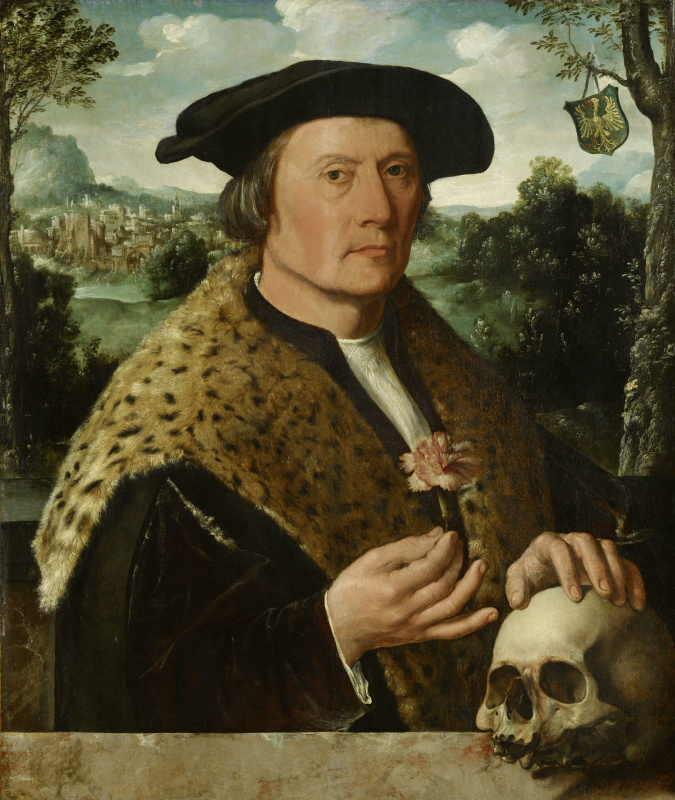 Hans Holbein used this optical illusion to show a double vision of life and death, referring to symbolism of Vanitas. Old age is an old age, there is nothing to add. 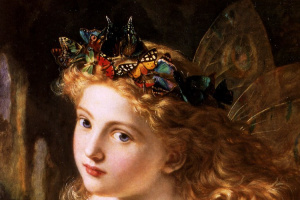 Artists did not skimp on realistic details when depicting old women who, in their frank and ugly nakedness, tried to reason the light-hearted enchantresses, "You will be the same as me." Old people, as a rule, like to philosophize. Therefore you can see a skull, and sometimes an hourglass near them. 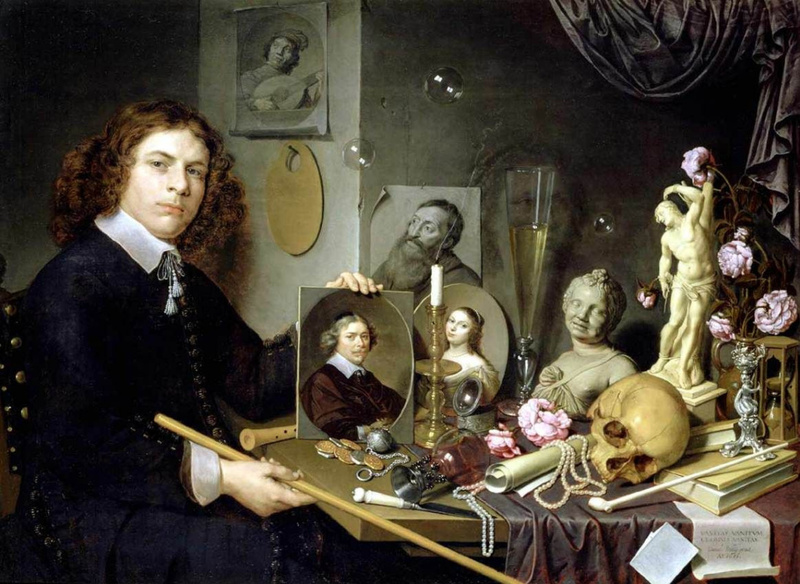 These attributes were successfully used in Vanitas still lifes, mentioned above. You can often see glasses in hands of the portrayed. This symbol has several meanings. 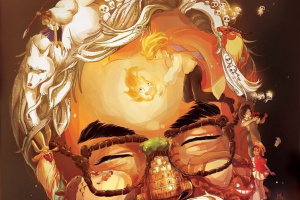 In portraits, glasses can indicate hero’s wisdom and knowledge, emphasizing his occupation. But in some cases this symbol was used with an irony, hinting on behavior that is not appropriate for a certain age. 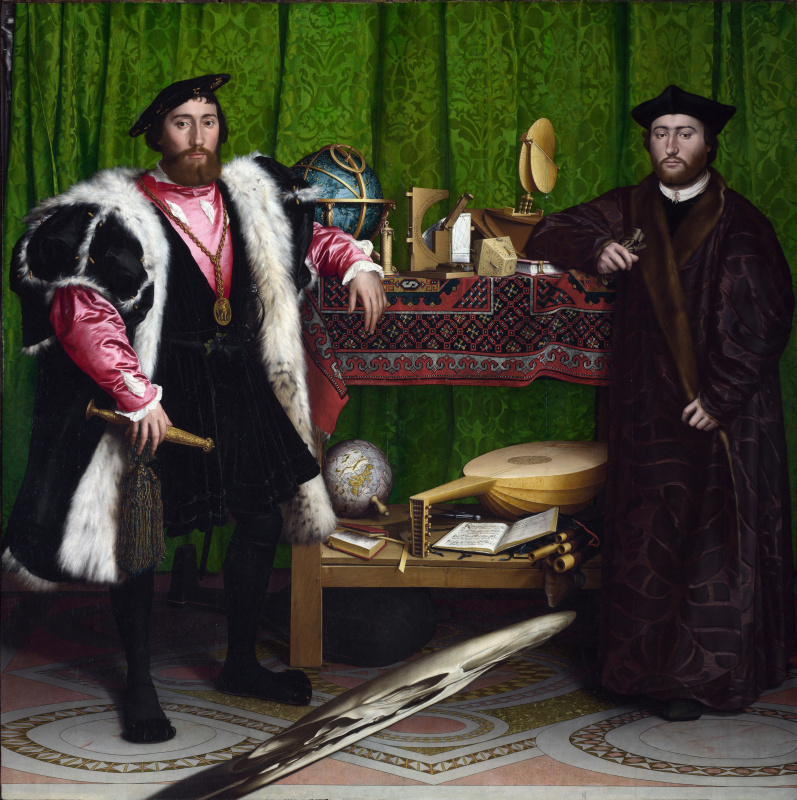 Left: Quentin Massys, Cannon Stephen Gardiner, 1510. Gartenpalais Liechtenstein, Vienna. 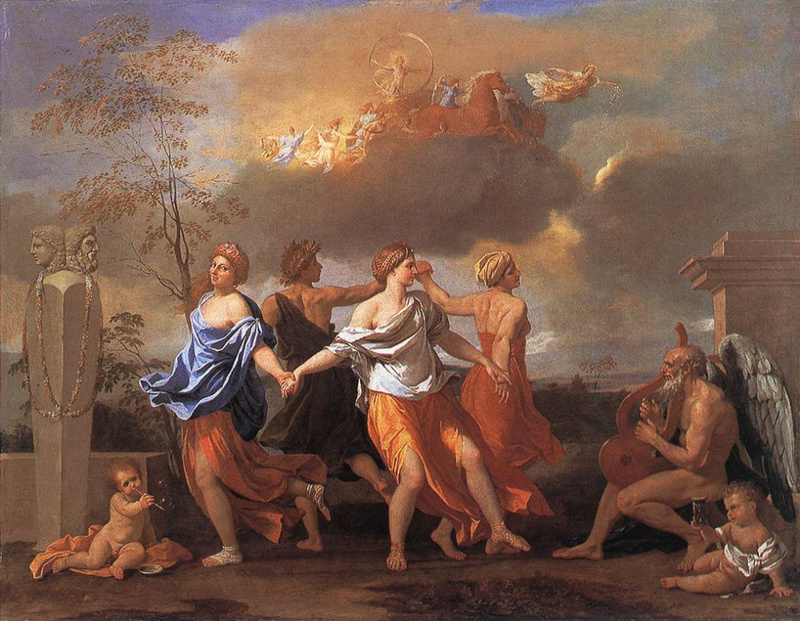 The variety of images attributed to the Time is most fully presented by Nicolas Poussin in his painting A Dance to the Music of Time, c. 1634−1635. The double-headed herm, depicting the youthful and mature Bacchus, points its old head towards the dance of Life, encircling Pleasure, Labour, Wealth and Poverty. Its young head looks out of the composition to the future. The round dance turns following the music of a winged gray-bearded old man, Father Time. 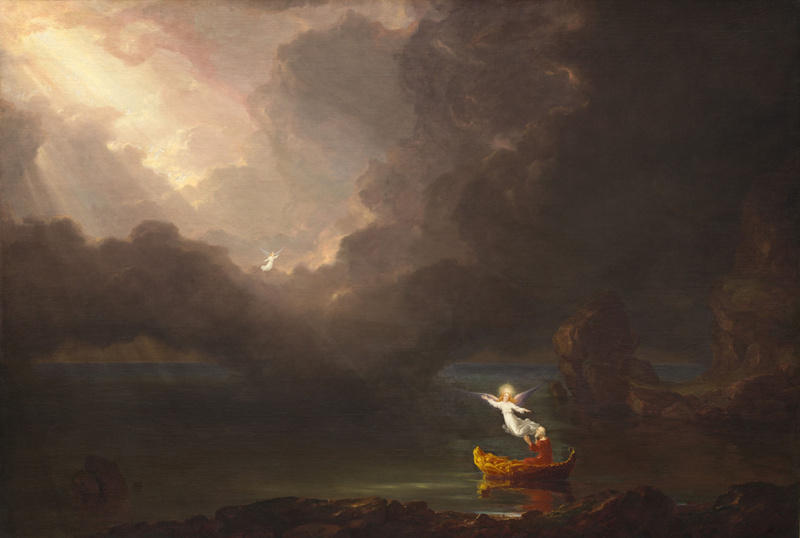 In the sky, the sun god Apollo rides across the morning sky in his chariot, preceded by Aurora (dawn) and followed by the Hours (goddesses of the seasons). 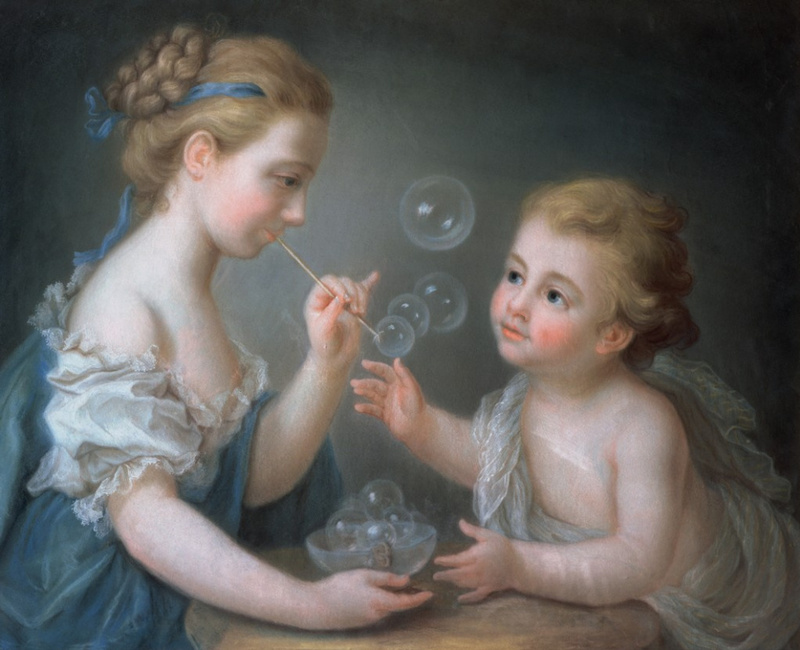 Two putti on the corners, one blowing bubbles and the other holding an hourglass, allude to the transience of human life. 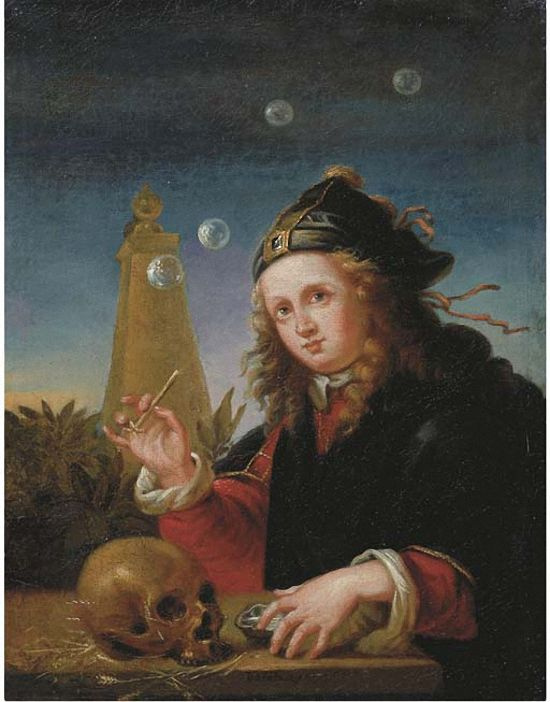 Soap bubbles on the Vanitas paintings symbolize the transience of human life and the abruptness of death. 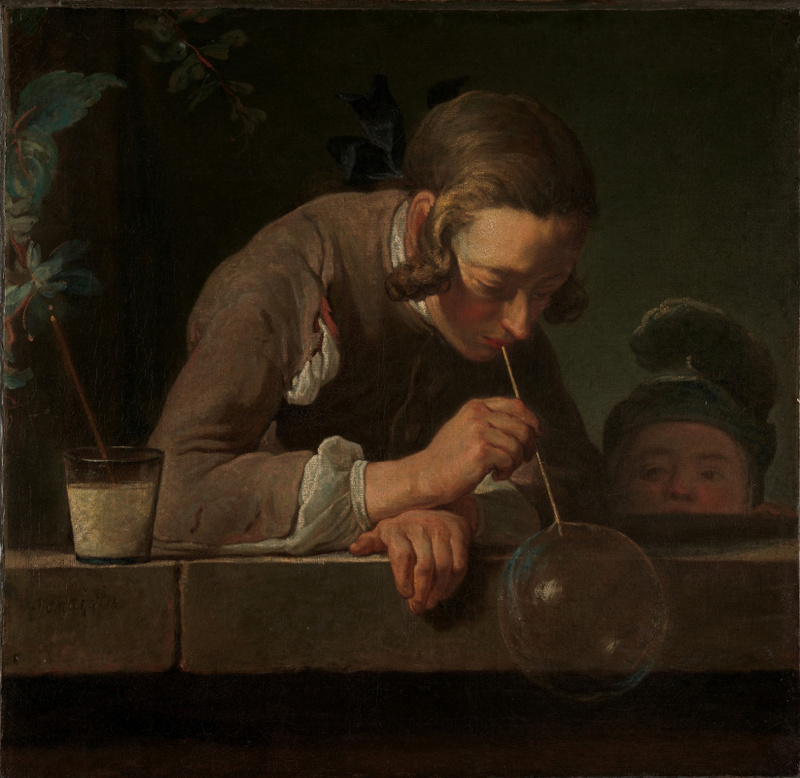 The origins of this concept lie in Roman literature: Marcus Terentius Varro, an ancient writer and scholar compared a human short life to that of a soap bubble (Homo Bulla) in his "Rerum Rusticarum Libri Tres" dated 2−1 B.C. This comparison has been successfully used by artists to this day. The putti holding an hourglass, reminds participants of life’s carnival about the non-stop running minutes. Needless to say that the hourglass had a very formidable subtext. Its first ever depicted image we can find on one of the three fresco panels The Allegory of Good and Bad Government painted in the Sala Dei Nove in the Siena Palazzo Public by Ambrosia Lorenzetti in 1338−1339. Observing his Allegory Of Good Government and the benefits that this brings to the city life and the surrounding countryside, we can find Temperance, one of the Four Cardinal Virtues on the sides of the Old Man, holding the hourglass, a symbol of wise use of time. However, in Christianity, the hourglass symbol was mostly used as an allegory of mortality and shortness and fragility of human life. 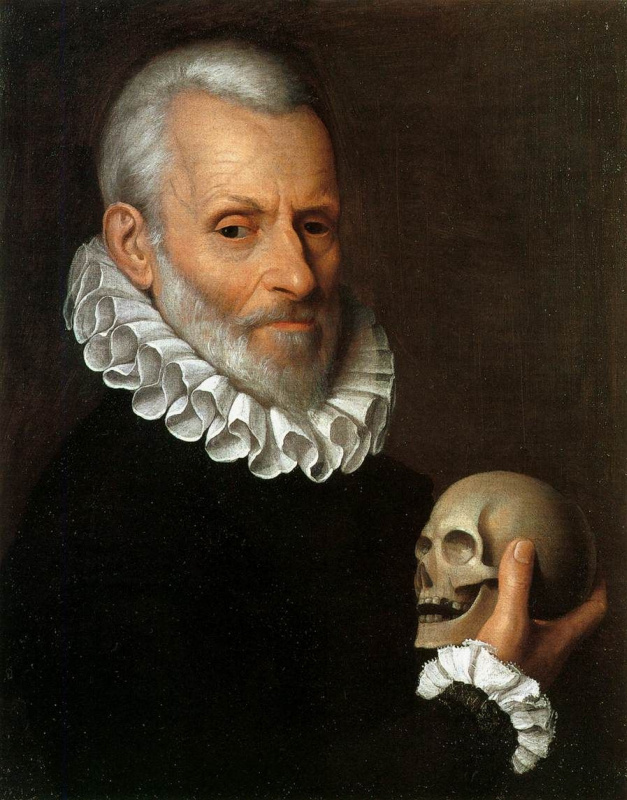 It was associated with the concept of 'memento mori' (a Latin phrase meaning ‘remember you must die', an irresistibly approaching Mortal Hour is coming). 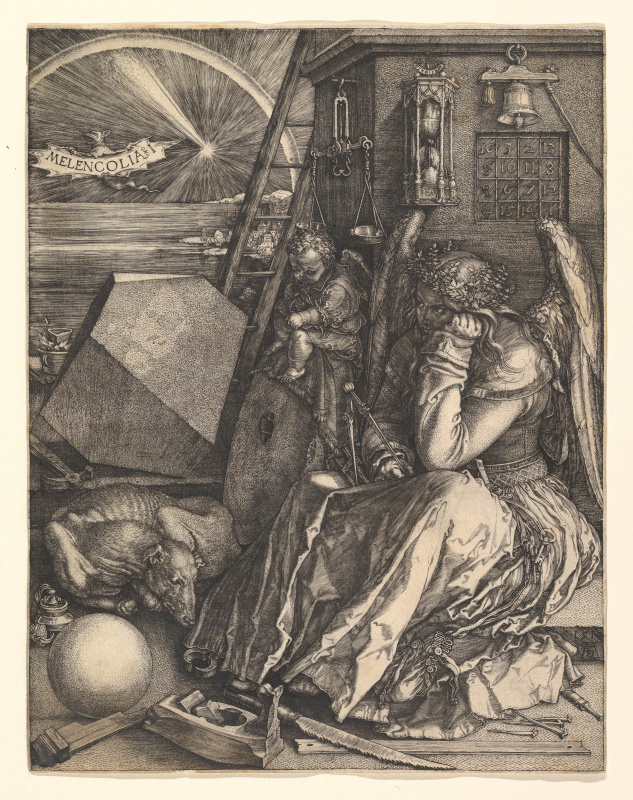 The same meaning Albrecht Dürer put into the hourglass images in his engravings (Melencolia I, etc.). 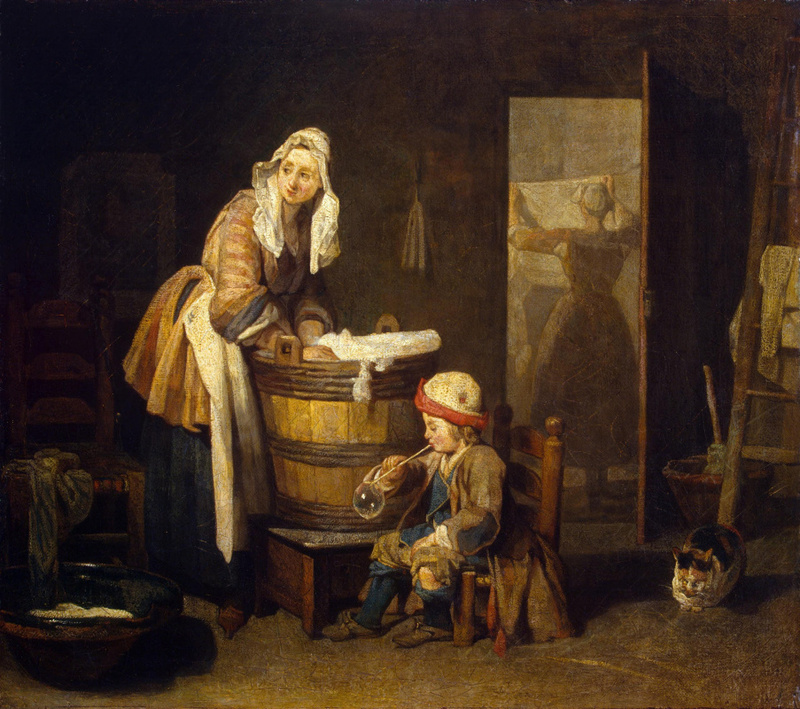 The oldest device — the keeper of time — clearly indicates the transience of the moments. For the Renaissance artists, the hourglass is also the very essence of an instant, elusive point between the past and the future. As the hourglass symbolized such a dogmatic and philosophical meaning, it shortly took one of the leading spots in Vanitas still lifes. 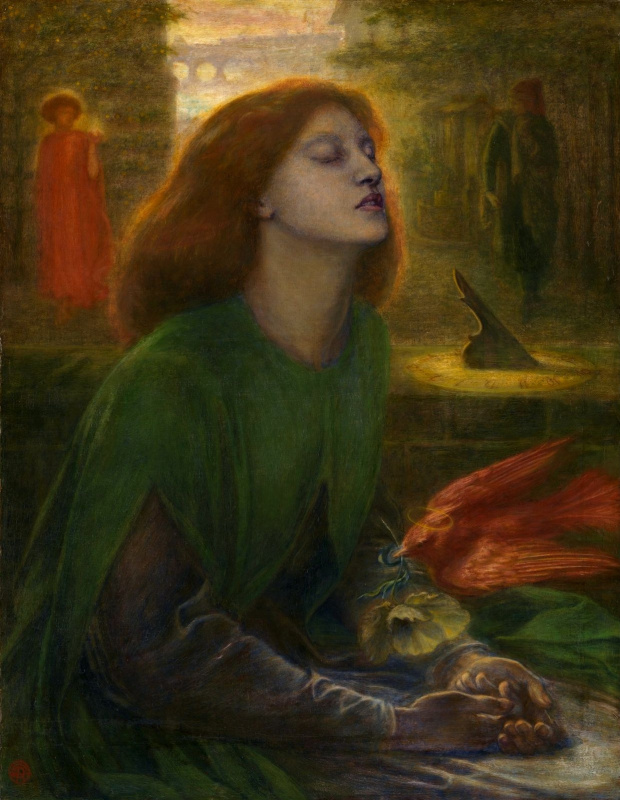 Hardly coping with premature death of his wife, Rossetti has been creating a monument to Elizabeth Siddal, a painting where she was depicted in the image of Beatrice from Dante’s poem "New Life" (La Vita Nuova) at the moment of her death. The sundial denotes the passing of time. Into the hands of the heroine, a bird (a herald of death) puts a poppy flower (Siddal died of an opium tincture overdose). Left: Dante Gabriel Rossetti, Beata Beatrix, c.1864−70. Tate Britain, London. Time is a mysterious substance. At its whim, it occasionally works for us, but more often against us: time waits for no one. 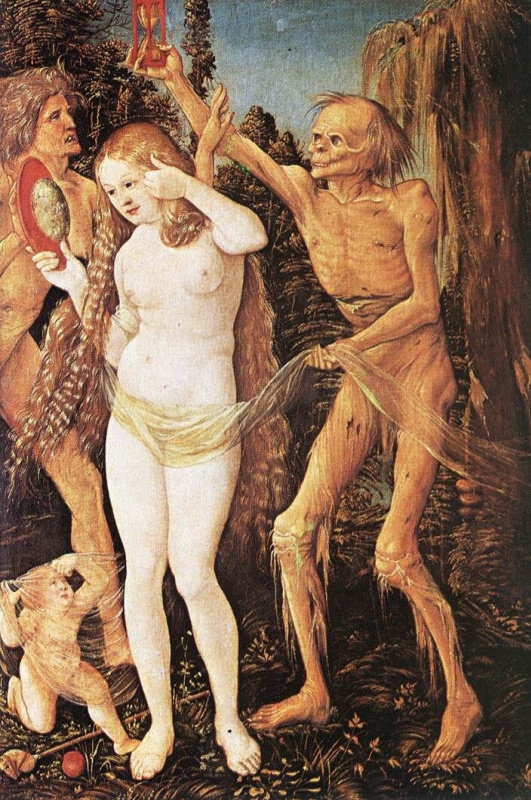 Death shows an hourglass to a blossoming, carefree young lady as a threat in Three Ages of the Woman and the Death by Hans Baldung Grien. Reflections on the beauty of the human body face frank image of death. Time is ruthless: Childhood is just a baby, a blossoming Youth is beautiful, but then follows an emaciated Old Age… The same artist captured The Seven Ages of Woman. 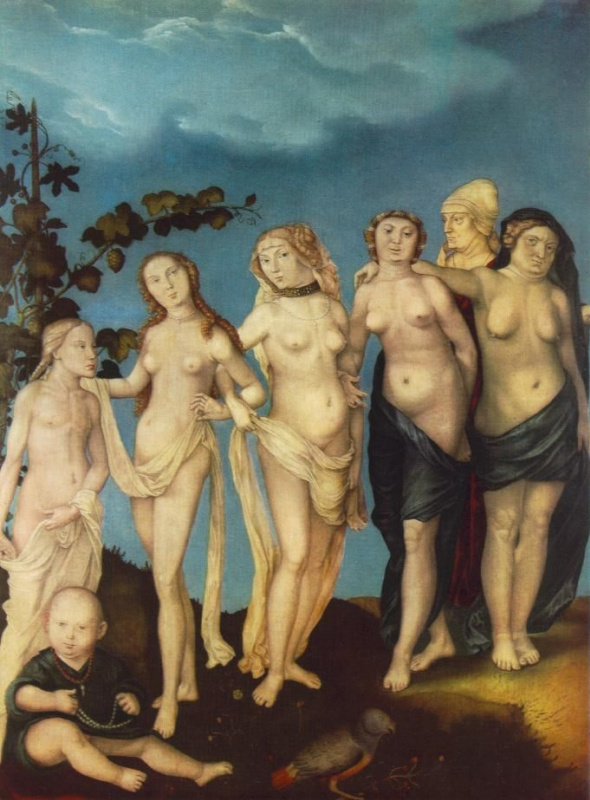 Left: Hans Baldung Grien, Three Ages of the Woman and the Death, 1510. Kunsthistorisches Museum, Vienna. 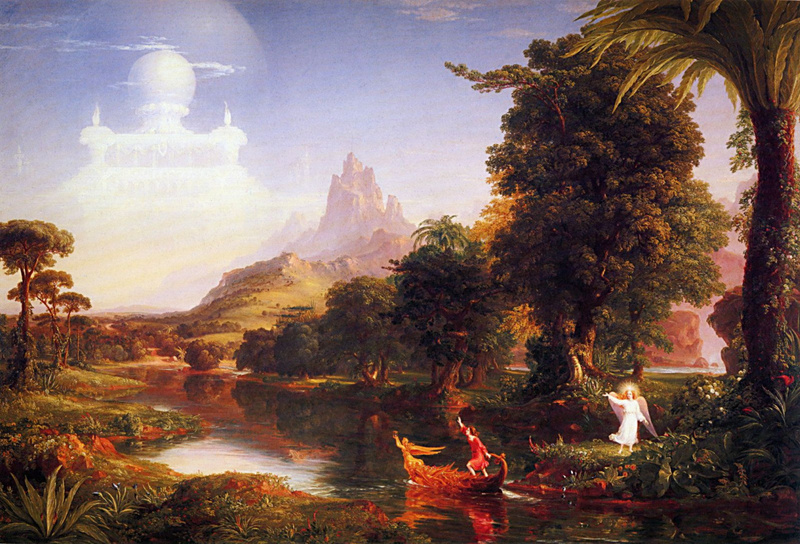 Fleetingness of time and futility of delights were threats invented for Venus. 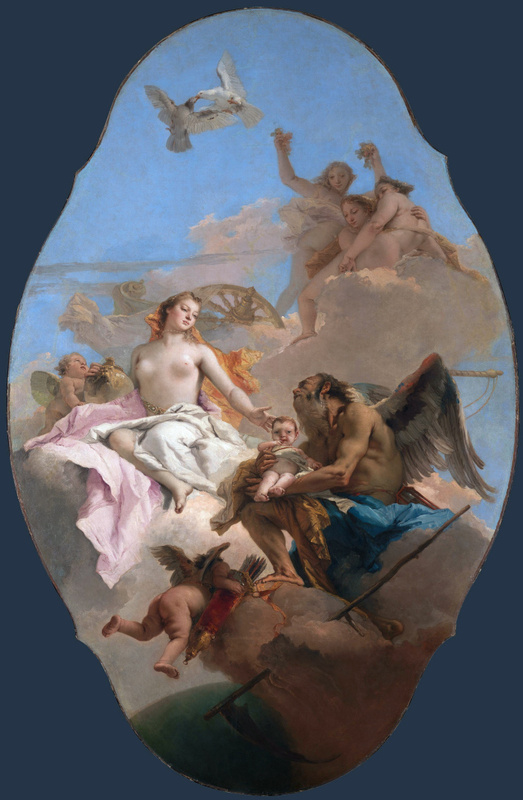 Artists especially liked to frighten the fans of Venus by placing Saturn next to her naked body (Giovanni Battista Tiepolo, An Allegory with Venus and Time, c.1754−58), or menacing Chronos (Agnolo Bronzino, Allegory with Venus and Cupid, c.1545). 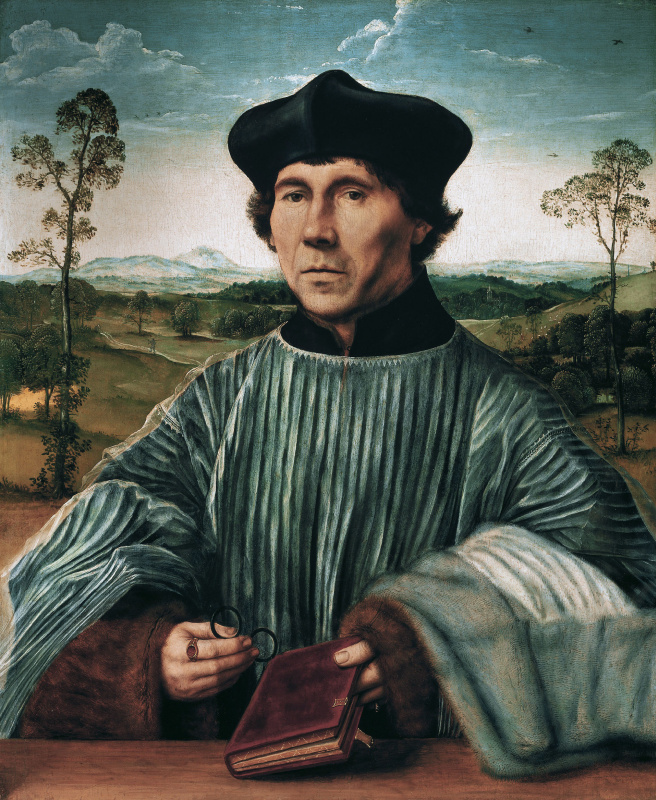 We can identify Chronos in Bronzino’s Allegory by an hourglass behind him. 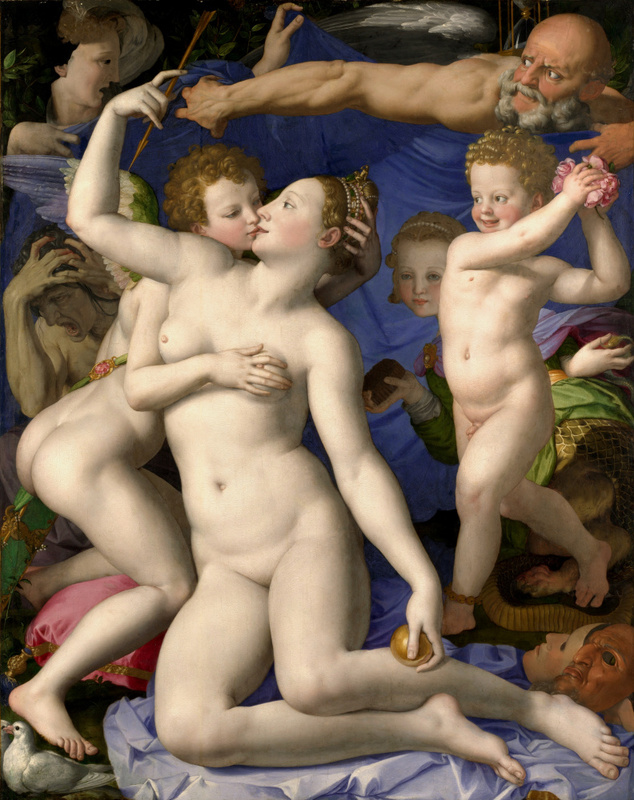 He stretched his powerful hand above the charming Venus and Eros. Well, Anthony van Dyck was even more severe with a little Cupid. 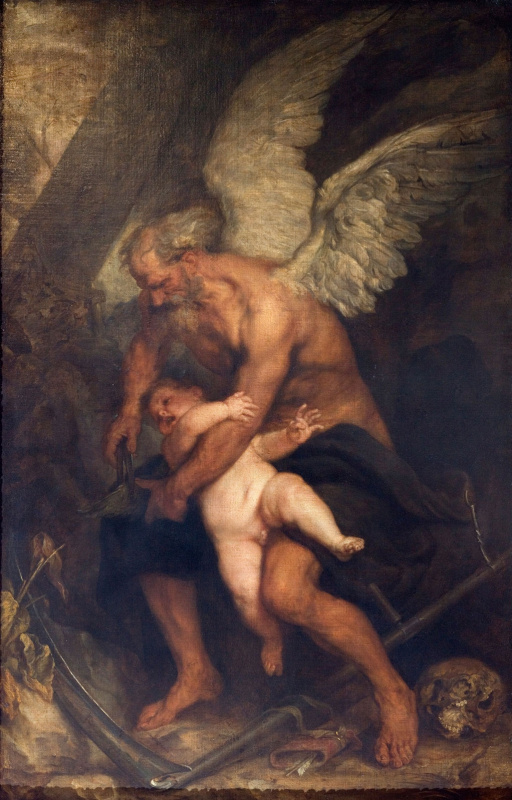 He depicted a personified figure of Time, clipping wings of Cupid (Anthony van Dyck, Time clipping Cupid’s wings, c.1627). 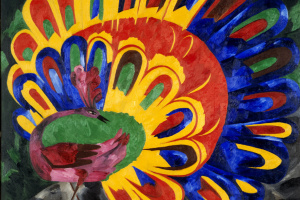 Transformation of the human image is accompanied by a plenty of symbolic attributes. Just notice how many epithets and comparisons we use even in our everyday life! Artists could not miss them as well. 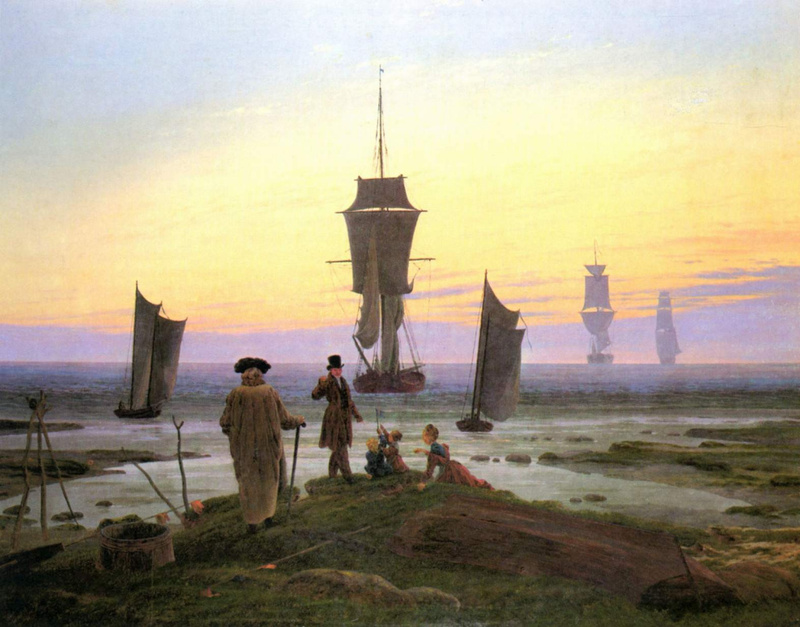 painter Caspar Friedrich David in his painting The Stages of Life (c.1835) offers allegories and symbols of his time. 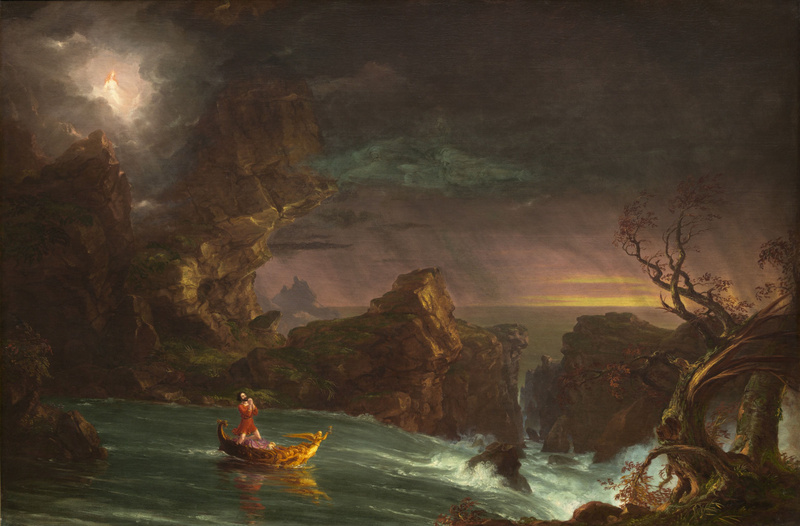 He set his scene on the beach of a sea harbor, symbolizing the beginning and end of all wanderings. There is a family on the shore: a couple, two children, and an elderly man. Each age has its own sail: two small fishing boats under full sail, heading to the open sea, symbolize small children, who are awaited by the distant roads and ways. Two fully-rigged ships on the horizon signify a married couple: parents have already gone a long way. The largest ship close to shore represents the old man, a person who has experienced life to the full and who now is finally putting into the harbour to end it. 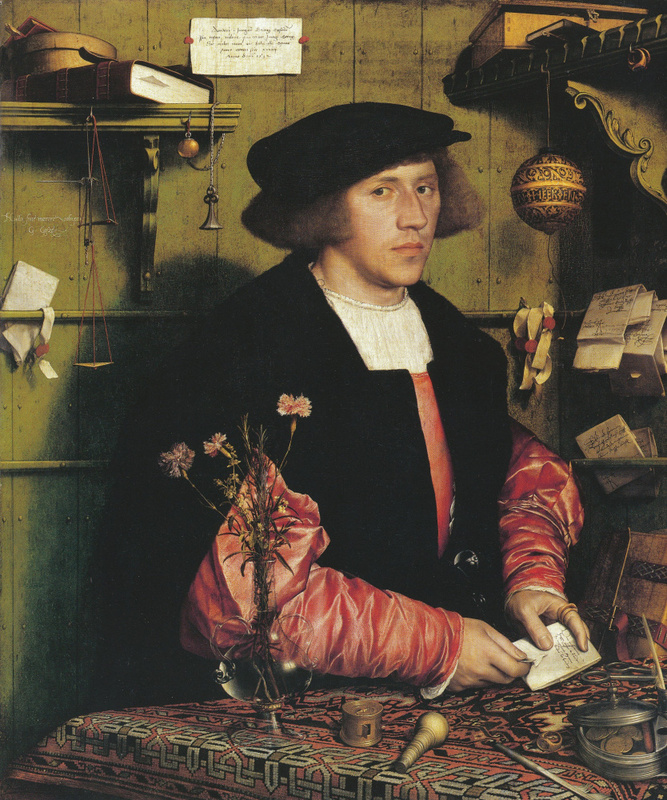 A Romantic artist Caspar showed everything in a deep interconnection through change of generations. And now, perhaps, is the most famous example. Gustav Klimt has captured the carelessness, pacification and despair all at once in his painting The Three Ages of Woman. Created in his "Golden Phase" (1905), this work conveys both feelings of joy and sorrow. 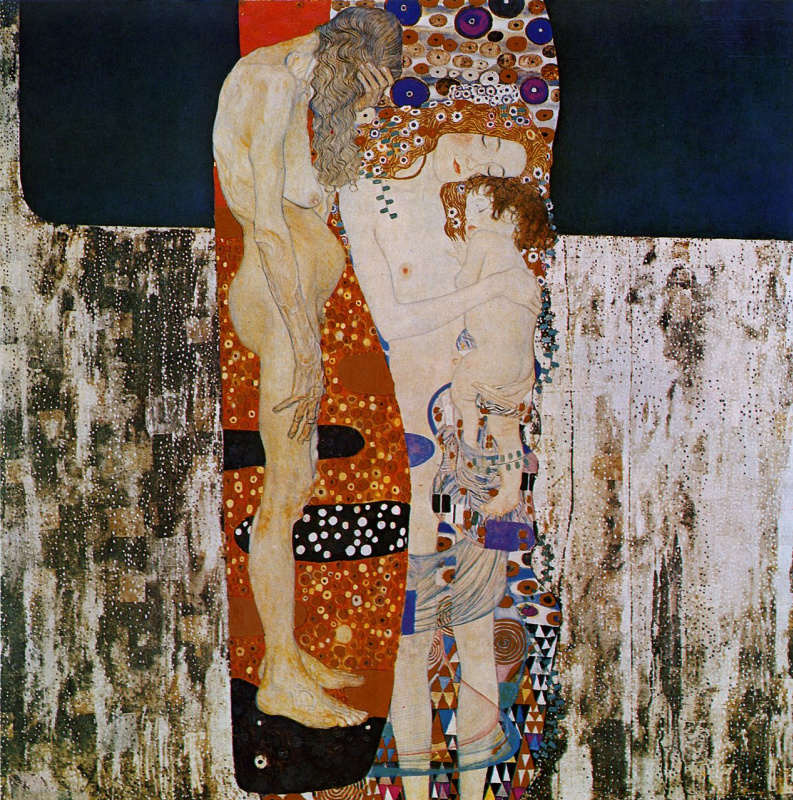 Conditionally dividing life time into three most important periods, Klimt shows life and death in their inseparable connection. Carefree infancy touches us with its innocence, the young woman — with her harmony within herself and with surrounding world, but the image of an old lady on a bright ornamental background evokes pity and dispair. The contrast is symbolic: the youth blossoms and changes, but the old age has all the joys in the past. 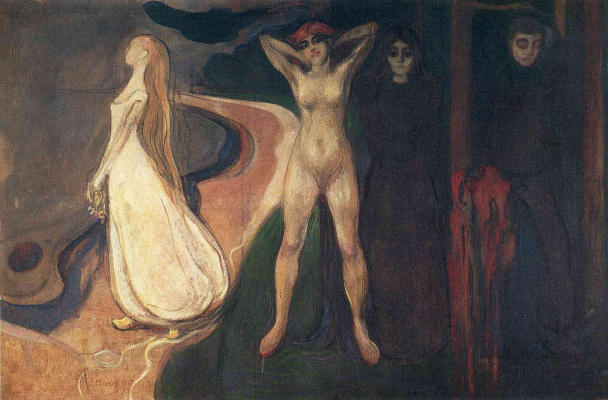 The vivid image content of Symbolism is expressed at its most in a series of Edvard Munch’s works. Tied together by subject matter and form, they focus on existential topics such as love, femininity, fear, loneliness, anxiety, despair, jealousy and death, and grouped under the name The Frieze of Life. 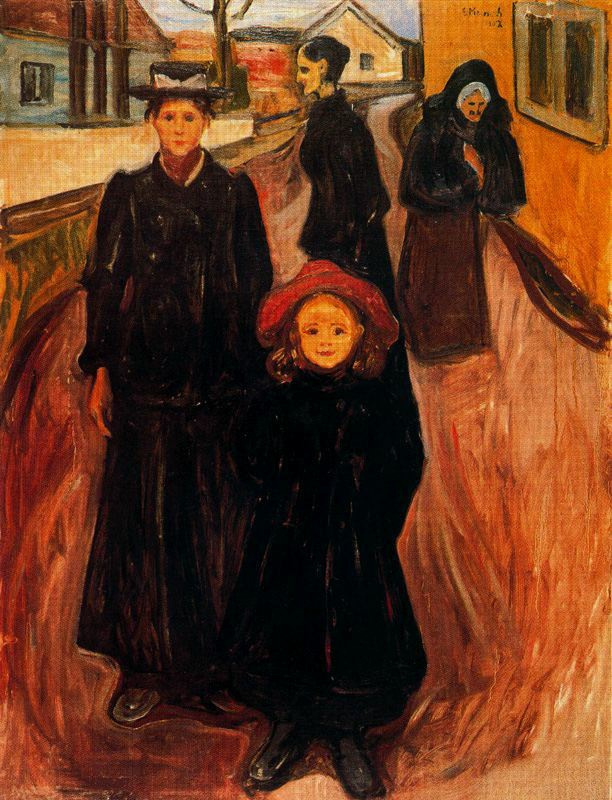 Left: Edvard Munch: Kvinnen i Tre Stadier (Woman in Three Stages), 1894. Munch himself claimed that he has been working over this poem of life, love and death for thirty years, when creating several copies and once again returning to the same topic, demonstrating its inexhaustibility. 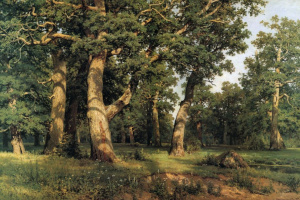 Paintings exist beyond time, but they form their own unique space. And artists will always strive to show their own vision of the canvas of life. 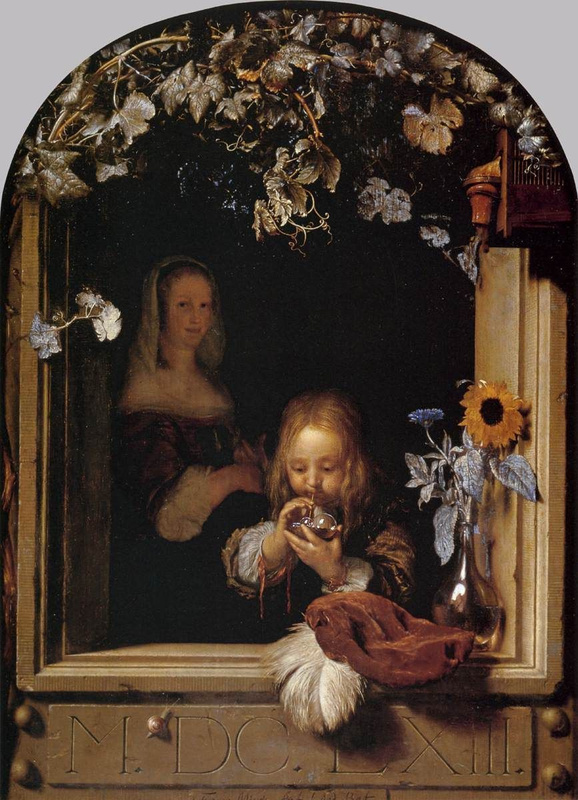 Title illustration: Frans van Mieris the Elder, Boy Blowing Bubbles, 1663. 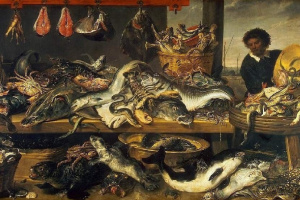 Oil on panel, 26×19 cm, Mauritshuis, The Hague.